How many jobs have you got to do today? Let’s see: probably check and reply to e-mails, do some online business updates, maybe write some sales material or shoot out an e-newsletter, and meet with some colleagues. Oh, and the spouse has dinner plans, so make sure you’re home on time tonight, and pick up a loaf of Italian crusty buns on the way home. You’re not feeling busy yet, are you? There’s a good chance that while reading the above, you’re thinking: “Oh man, you have no idea.” Ignoring all your personal matters, just being in online business and contending with the various duties day-in and out alone are tough beyond belief. The seasoned pros often say it’s all a matter of time management. You have to work to see how you can balance all of your work-related duties while still making time for your personal commitments. It’s a real trial by fire and takes a while to get used to. Despite what you may think about these old codgers’ anecdotes, they have a point; online business is all about management, and certain tasks require a lot of it. Social media management is a big part of this, and if you get into social media as a business tool, managing it is its own big task. That said, it can be a lot of fun and very lucrative to your business. When using social media, it’s good to think about how you want to approach it for business purposes. Oddly, social media is something you can manage at either a full- or part-time level. If you are able to tackle it at a more full-time level, you will likely open yourself up to more potential rewards, but even the part-time work can be just as lucrative if managed properly. You often hear businesses and pros offering to have you “like [them] on Facebook” or “follow [them] on Twitter.” In a way, this jargon is actually vital to your success. If you sign up for social media, you have to sign up on more than one web site and decide which ones to use what each one’s audience and goal is; this varies from site to site. Then there’s scheduling. Using social media, full time or not, is not something you can hack at during all hours of the day. Like a lot of other digital business applications, you have to work on them, then leave them to grow see what results they generate. From there, you can determine what changes need to be made and what functions are working better than others. Rounding things off with social media means falling into a groove of regular work. This means regularly scheduling updates to the sites themselves, letting the public know about new developments or promotions via your social media blog, and adding the occasional flashy advertisement to reenergize public interest in your work. 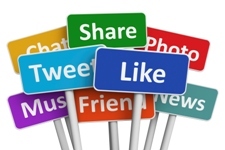 Don’t pass up any business chances with regular social media updates. This means doing social media optimization on your social media blog postings whenever possible, adapting similar social media SEO so that your content can be found online, and keeping your new information interesting to any readers that might find it through a random search. Social media management is not something that’ll likely land you as much success as certain online marketing campaigns, but regular updates with quality content, both in text and visuals, can boost the public’s interest in your business and create new customers. If you’re going to do the rounds in social media, you just need to fall into the groove of doing it again and again.